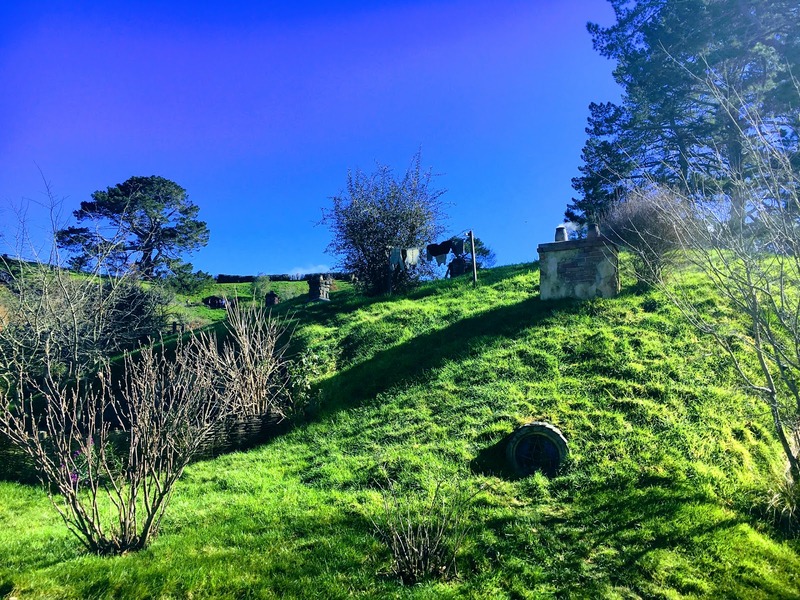 Lydia and Zoe wanted to do some nerd thing at a local spa so Steph and I ditched them for a much cooler-kid activity: a visit to where they filmed the Shire in the Lord of the Rings movies. We arrived at Hobbiton Movie Set a little early and so had time to poke around in the gift shop a bit. It was serious. Steph and I debated buying matching cloaks before the tour. Luckily it was all really expensive so I wasn't tempted to buy anything silly. We popped into the Shire's Rest Cafe to kill a little more time. When I spotted "elevensies" on the menu I was going to order it really regardless of what it was. Second Breakfast was also on the menu. I think elevensies was a baller way to start our journey. Yeah... I took a lot of pretty touristy pictures today. Sorry about that. They had their own line of beers sold only at Hobbiton. Spoiler: I bought some. Later on the tour our guide told us that they specially brewed a 1% alcohol beer called SobeRing Thought for the cast to drink during the movie so they didn't get drunk after multiple takes. New Zealand was pretty cold, and I didn't bring a hat for my bald noggin. Lydia lent me hers which was nice, but the black on black made me look like a cat burglar. Or like a failing hiphop artist. Our first guide was named Pip. They played a video with Peter Jackson welcoming you to the Shire. The first thing that I noticed was the authenticity of the place. I expected this to be a really hokey, run-down ruins of a years old movie set. But the gardens had stuff growing in them and there were little sets of clothes drying on little clotheslines. A few of the chimneys had smoke puffing out of them. They did a really good job of keeping the place legit. It was as if the Hobbits were all just out for lunch or something. They paid excellent attention to detail. The little axe and chopping block had fresh sawdust all around. As you might be noticing the doors are wildly different sizes. The filmmakers used this to make the hobbit actors look tiny and the other characters look large by comparison in different shots. A few of the doors opened and you could enter, but there was just an unfinished hole in the ground inside. The interior shots were all filmed on a movie set someplace else. Bag End was the home of Bilbo Baggins, afterwards of Frodo Baggins, and later of Samwise Gamgee and his wife Rosie Cotton. Lucky for me the most famous place in the Shire was being restored and had ugly scaffolding all over it. So my understanding is that after the Lord of the Rings trilogy the temporary set was largely thrown away or just fell apart. Once they realized that this was a good tourist thing though, they built a more permanent Hobbiton for The Hobbit trilogy. One of my favorite parts of the tour was all of the cool movie facts. Director Peter Jackson sounded like some sort of emperor with the power he wielded over this place. For example the tree atop Bag End is artificial. For the first trilogy they found a tree that they liked, cut it into pieces, then reassembled it on the site. Ok. Well for the prequel trilogy they needed a younger version of the same tree. This being impossible they made an artificial tree from scratch. There are between 200-250K leaves on the tree which are painted. They have to be repainted every winter. For the movie Jackson decided that they were the wrong shade of green so they all had to be repainted via crane. In another tree related incident they needed a plum tree in a particular place but the tree that lived there wasn't a plum tree. So they pulled off every single leaf and wired on new ones along with some plums. The tree is apparently visible only in the extended version of the movie and only for 3 seconds. The sheep that lived in the area looked too modern so they brought in new ones from the south. The frogs that lived in the pond were too loud so they paid someone to catch them all and release them someplace else. I guess for one scene the sun was setting in the wrong direction so they played that scene backwards. They had to blur out birds visible flying backwards from those shots. The "no admittance except on party business" sign was from during the week of Bilbo's 111th birthday when they decide to leave the Shire. I didn't talk to girls much in highschool. This is Samwise Gamgee's house. You get a good look at it in a couple parts of the first trilogy. In the beginning of the first movie. And the end of the last movie. The whole trilogy ends with his big yellow door shutting behind him. A powerful thirst hit me after all of that hobbit-holing. Time to head to the Green Dragon Inn. I've heard songs sung about this magnificent place. The staff was really fun and seemed to enjoy that we were enjoying ourselves. There was a particular beer that they only sold at this bar. You couldn't even get it in bottles. So of course I had to start with that one. They had a rack of loaner clothes and even some cool walking staffs which I took advantage of. Even the toilets were well themed. That old-timey above tank thing was just for show. I poked my head into a venue-looking place around back. I guess you can buy a ticket package where they let you eat here as well. Jealous! I recalled downtown Matamata had a cool Hobbit-styled visitor's center so we popped over there on the way out. 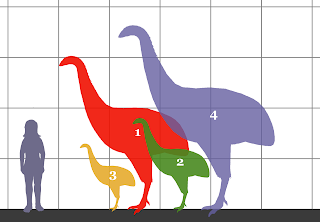 Moa were a few species of monstrous, flightless birds that used to live in New Zealand before the Maori hunted them to extinction. Can you imagine these monsters still roaming around? Maybe they'll pull that cloning trick and bring them back to life someday. We stopped at the hunting lodge themed Five Stags Tavern in Leamington for a bite to eat. I hunted this plate of green-lipped mussels to extinction. I don't remember what we ordered. Fries or something but they came with a giant dollop of really thick sour cream. It was almost like a cheese. Rotorua, the tourist town, had a zoo where you could see kiwi birds but I balked when I saw the price. Plus we really only had the interest or time to see the kiwis and didn't need the rest of the animals. Well the highway provided us with a solution: the Otorohanga Kiwi House and Native Bird Park. The staff was super nice and gave us a discounted rate when we told them we only wanted to see the kiwis and leave. Kiwis are nocturnal so their enclosure was dark as hell. Once your eyes adjusted to the low light though you could see a few kiwis in there poking around with their long beaks. They are the only bird with nostrils on the end of their beak, so they can stick that thing in the ground and sniff out bugs that they couldn't even see. They were much larger than I would have guessed. Kiwis lay the largest egg in relation to their body size of any species of bird in the world. Other birds are constrained in this respect because they still need to be able to fly. We really packed in the tourism today. Our next stop was the Waitomo Glowworm Caves. 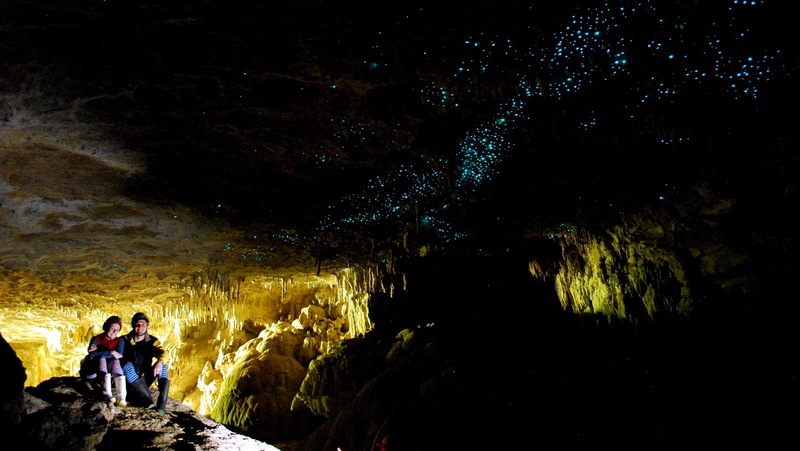 They wouldn't let us take pictures, and they wouldn't have come out right anyway, but the cave ceilings are covered with thousands of little blue lights emitted by a worm. The worm dangles a little bit of sticky slime, emits the light, then waits for prey to approach the light thinking it's a way out of the cave. Here's an annoyingly awesome photo of it from Wikipedia. I grabbed a special edition of the Whittaker's chocolate slab that we tried yesterday. This one was sponsored by the All Blacks, New Zealand's national rugby team. Zoe got some of her special people food at Burger King. Speaking of Zoe she wanted to try driving on the left so I let her take the wheel for a bit. It was a terrifying few minutes. 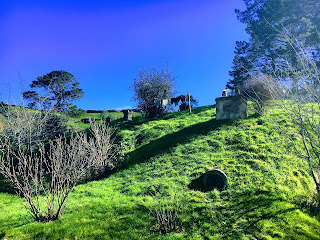 We roamed around Auckland a while. It was Saturday night after all. One memorable random occurrence was an impromptu marching band of what looked like drunken students. Why not? We hit a food truck called The White Lady. It had a Steak n' Shake vibe going on. I was honorbound to order an Aucklander. It was legit just two steaks on a bun. I tried the shakes and was again disappointed. They seem to share Australia's confusion that a milk shake is not just shaken milk. For shame! I guess the law in New Zealand is that if you don't have a local driver's license then you have to show your passport to buy booze. We didn't have our passports on us nor really have much respect for that particular law so after a bouncer rejected us I just picked another bar I didn't think would ask. Boom. Almost time to leave New Zealand. Sad!